e-corder units are used for the collection, display and analysis of signals from various types of laboratory instruments. It is supported with Chart and Scope software for complete operation. 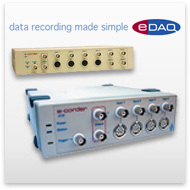 Each channel of the e-corder has independent adjustable channel sensitivity and filtering, this feature make it capable to collect data from completely different types of sources on different channels (e.g.pH oxigen concentration and temperature). Systems with 2,4,8 and 16 channel are available. Educational & Research Electrochemistry system.